Simply, the Best Way to Go Places! 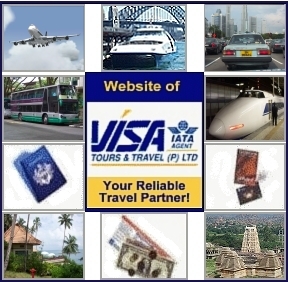 Bulletin: .. .. .. .. .. .. .. .. .. .. .. .. .. ..
Air Tickets, Cruises, Car/ Coach Rental, Rail/ Bus Passes, Hotel, Tours, Telecom, Visas, Insurance & Passports, Money Exchange. Wings, Waves, Wheels, Whistle, Wigwam, Window, Wise, Wallet, Wireless. All rights reserved. Reproduction in whole or in part of this website, in any form or medium without written permission of Visa Tours & Travel [P] Ltd. is prohibited. 2002. This site is designed & developed in house by S. Karthik. WWW.VISAWIZ.COM Best viewed now in 1024x768 resolution.